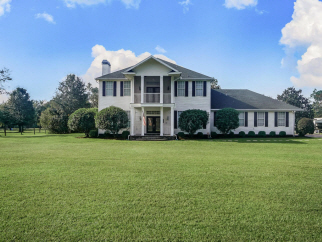 Interior Features This BEAUTIFUL Southern Colonial home on 5 acres with a HUGE Screened Pool and multiple balconies will impress! 10' ceiling with triple crown molding, Glass double french doors throughout. Large White Kitchen features breakfast bar, large eat-in area with ample space, desk/workstation and cabinets galore!A grand gas fireplace is the focal point of the Family Room with ceiling fans and lots of windows for natural light. Three large bedrooms upstairs including expansive Master Suite with very large Master Bath including double shower and garden tub. Two additional spacious bedrooms with walk-in closets-one of which has a laundry shoot, share a Jack and Jill bathroom. One bedroom has private double door entrance to 2nd story rear porch.. Dramatic staircase to 3rd story bonus room with opening skylight. Downstairs laundry in large designated room and Mud Room off Kitchen. 4th private bedroom on main level with full bathroom. Exterior Features Screened balconies front and rear with the huge rear balcony overlooking the large heated pool complete with hot tub and outdoor shower in a dramatic screen enclosure. 5 Acres! The Lanai makes entertaining a breeze with large covered space with ceiling fans and is ready for an outdoor kitchen (down draft vent installed, hot and cold water and propane piped in).Fenced for horses - crossed fenced with three pastures and a covered shelter/stalls for horses, 30'x60' foot metal storage shed and Chicken Coop.An Equine neighborhood and livestock friendly.